On December 7, 2018, President Trump announced William P. Barr as his nominee for Attorney General of the United States, following the forced resignation of Jefferson (“Jeff”) Beauregard Sessions III. As head of the U.S. Department of Justice (DOJ) and the nation’s top law enforcement official, the position of Attorney General is one of unparalleled power within the Executive Branch and has profound implications for civil rights. The Attorney General must work to advance the full mission of DOJ which includes working to “ensure the fair and impartial administration of justice to all Americans,” including by monitoring and enforcing Americans’ constitutional and civil rights. It is therefore essential that any nominee’s record on civil rights is thoroughly and closely scrutinized before confirmation to this position of extraordinary public trust and firmly opposed if that record indicates a lack of commitment to the constitutional principles of fairness, equality, and the rule of law. 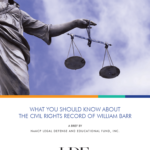 Read LDF’s full brief on the civil rights record of William P. Barr. 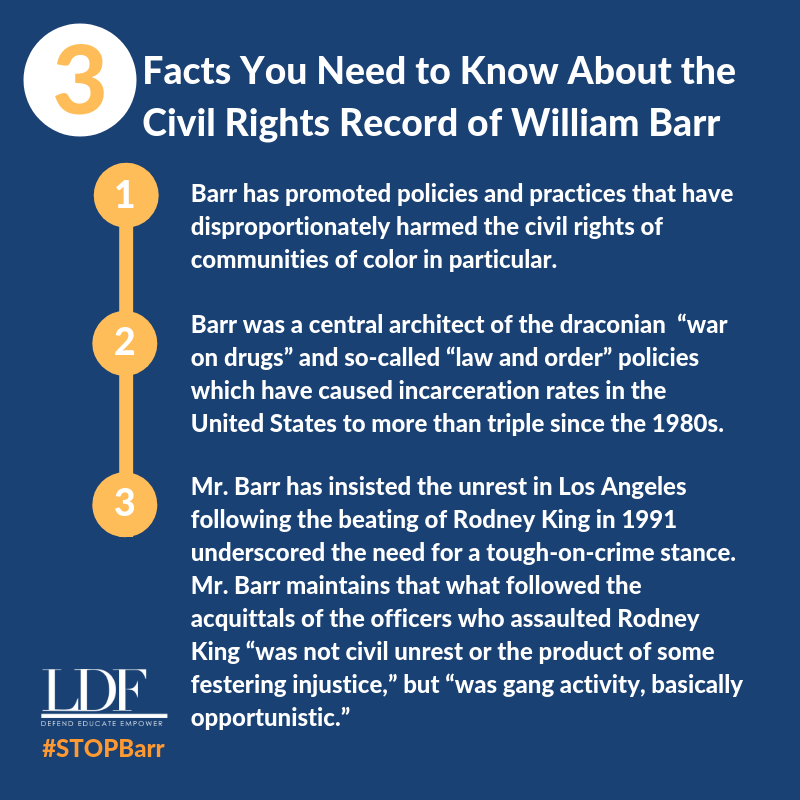 A review of his record before, during and after his service in the Bush Administration demonstrates that Mr. Barr is hostile to sensible criminal justice reform, marginalized communities and legislative checks on executive power. 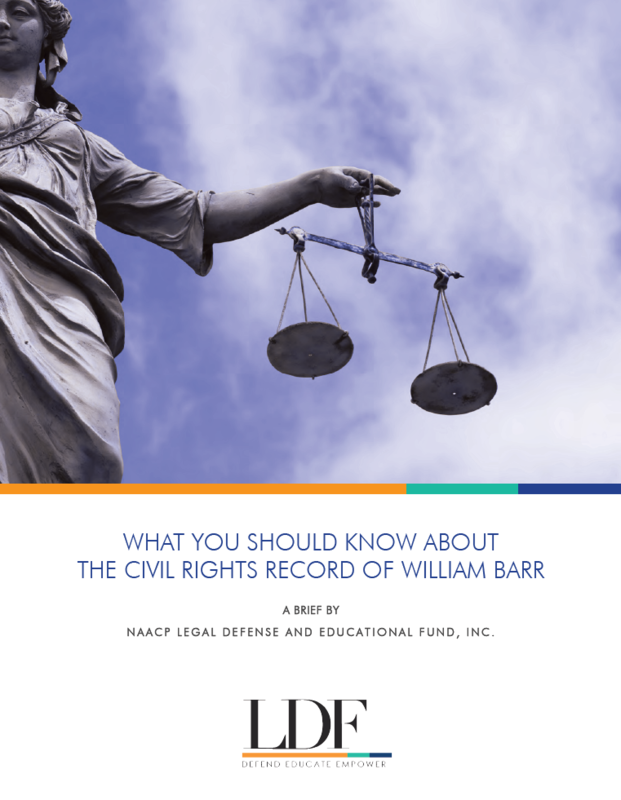 Indeed, given the current attacks on our civil rights, Mr. Barr bears the burden of showing that he will indeed promote these principles and will not continue or extend the rollbacks of our civil rights ushered in by this Administration. It is the Senate’s constitutional duty to review his record thoroughly and impartially and to consider whether Mr. Barr will defend civil rights and the rule of law.